Dr. Deborah L Cuadra, MD is a Doctor primarily located in Seminole, FL, with another office in Safety Harbor, FL. She has 23 years of experience. Her specialties include Obstetrics and Gynecology. She speaks English. Dr. Cuadra has received 3 awards. The overall average patient rating of Dr. Deborah L Cuadra is Excellent. Dr. Deborah L Cuadra has been rated by 10 patients. From those 10 patients 6 of those left a comment along with their rating. The overall rating for Dr. Deborah L Cuadra is 4.6 of 5.0 stars. I am a returning client to Dr. Cuadra for my 2nd child. Thru my first and this pregnancy she has been amazing. Always caring, always willing to answer any questions I have. The staff is wonderful and caring. I absolutely love them and recommend them to anyone pregnant or just wanting a caring doctor! I just had a baby 3 weeks ago and Dr Cuadra was my Dr. She is amazing, kind, caring, and makes you feel totally comfortable. Dr. Cuadra graduated medical school here at the University of South Florida College of Medicine, and completed her residency training at Loma Linda University Medical Center. Dr. Cuadra has been providing sound womens healthcare for 16 years. Her years of experience within the medical field allows her to provide top of the line service to each and everyone of her patients. Take a minute to learn about Dr. Deborah L Cuadra, MD - Obstetrics and Gynecology in Seminole, FL, in this video. Dr. Deborah L Cuadra is similar to the following 4 Doctors near Seminole, FL. 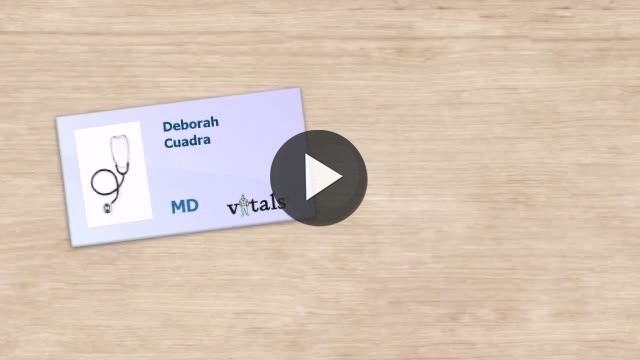 Have you had a recent visit with Dr. Deborah L Cuadra? Select a star to let us know how it was.